Outlook Mac Archive Tool (OMAT) is an application for archiving mail and calendar items over a certain age. As mail accumulates (or calendar events with large attachments in them), your mailbox storage space fills up. This causes speed problems, your system is more prone to corruption and if your company applies quotas on mail storage (most do), you soon run out of space. Mail under ‘On My Computer’ is only constrained by the size of your machines drive but it is susceptible to loss if you lose the contents of your drive or if your Outlook database is corrupted. To help with these issues you can optionally enable Cloud Archive which will move your mail in to a selected GMail (or IMAP or Exchange) account of your choice. Gmail is well suited as it often has considerably more space than your corporate mail accounts. See this guide for enabling Cloud Archve. NOTE: Archiving involves moving large volumes of your mail to different folders and potentially accounts in the case of cloud archiving. Though our tool operates with highest levels of safety, we can’t control the stability of your local operating system, installed software or other environmental issues. It is therefore wise and recommended to make a backup of your Outlook mail store (Identity) before conducting these operations. Steps 1 to 3 of this article can guide you through a backup. If I grasp this correctly, your tool leaves mail where it is, within the Outlook DB. I want to extract my mail away from Outlook to prevent the instability issues surrounding a large Outlook DB, and above all, make it generic. CSV TAB or similar. Thus I own my data. Uploading it to yet another ‘corporate’ where they control it is a bit ‘frying-pan into the fire’. Does this work like the now defunct OEAX in giving me the data? I would like to archive emails to our server, am I able to do this or do I have to create a cloud for archiving? You can push archived mail to any server allowing IMAP push. If you have a local IMAP server this could work or any of the cloud providers offering IMAP. Great tool! Several MAC people within my organization use it and love it – they’ve used it for several years. A question came up today that I couldn’t answer. The situation: A user created a 2015 archive and used it for two months, and then somehow switched to another archive name, which was used for approximately one month. The user switched back to the 2015 archive folders, but has a months worth of email sitting in the other archive. How can we merge the mail from the wrong archive to the 2015 archive folders? When we try to move folders (within Outlook) we receive “That folder already exists” messages. The user has hundreds of folders and subfolders, which, if we have to go into each folder to manually move the emails, will be a time consuming and tedious job. Do you have any suggestions on how we can resolve this issue? Thank you, in advance, for your reply. Thanks Roger, time has flown that it’s years already! 🙂 My first thought would be to cloud archive the folder back in to the online account from On My Computer (allow it to sync!) but it depends on your folder structure. So you could effectively set up a new profile setting in which you select your current online account, then indicate the ‘destination folder’ as ‘Inbox’, select the ‘from’ folder as Inbox (of On My Compter by definition) and then it will sync back all email in to the Inbox including all it’s sub-folders. We’ve not done this before so THIS NEEDS TESTING and backup the identity to be extra safe! 🙂 You will need to setup a folder for Sent Items etc However, if all your folder are in root then this technique won’t work (or will be tedious) and a custom script would be needed which we can maybe help on. I have the 10GB size mail box which contains lots of sub folders,I would like to know the tool which will help me to archive all sub folders, and its reflect under on my computer. Also when i search mail it should include the archived mails as well. I’m using the brand new version of outlook … without export function (damn’it !). I’ searching a software to “restore” this function. In fact i have a lot of archive in OLM format or PST format and i want to export it to save (on a local NAS). I some cases i’ll just want to open the archive for read a mail os search information. Does your product is ok for this job ? I agree it is frustrating that it was removed. Unfortunately our tool does not support physical export of mail to file. However, it does take a completely different approach which is to allow you to move the mail out to a cloud account (any service that supports IMAP). 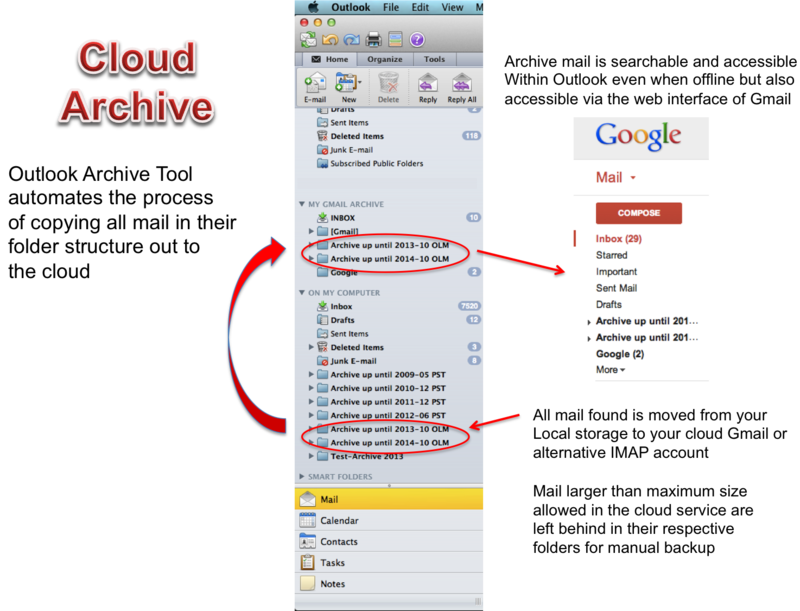 For example you can backup your archive of mail to a gmail account. This makes it easily searchable and even more reliably backed up than local storage options. Your English is excellent compared to my French! Hi Michael, I’ve been enjoying the app for the past year, but have a question. I’m moving to Mac Mail using the Exchange connector. I’d like to remove my Outlook client, but still want to retain my archiving functionality for my Exchange box via OMAT. Does OMAT require the Outlook client to be installed or is there a way to remove it and still have OMAT functionality? Hi Mark, unfortunately OMAT only works with Outlook given it’s the most common exchange client for Mac. The software does not operate server side. We do however support the new Outlook Mac for Office 365 which is considerably better client than Outlook Mac 2011. 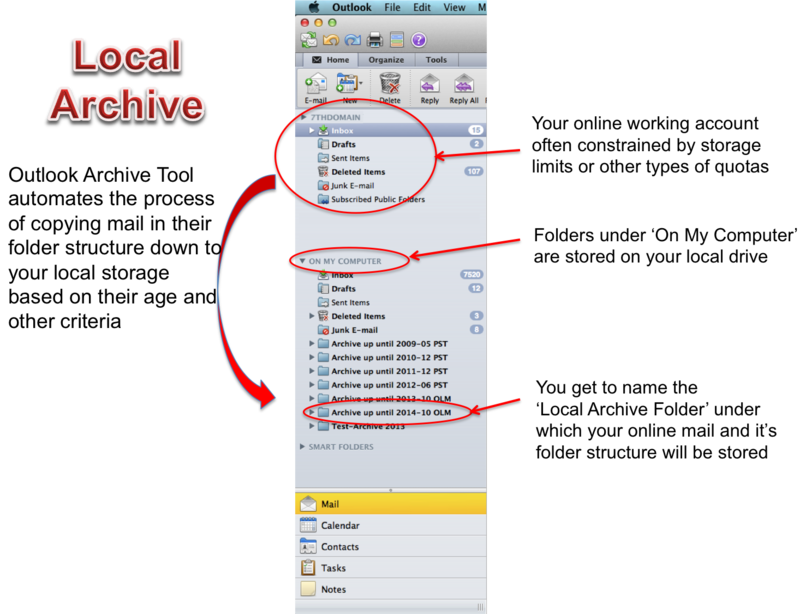 If you will only have Mac Mail installed then our tool will not archive anymore. We would like to create the Mac Mail version in the future but it’s not on our short plans as yet. Thanks Michael, that’s what I thought, but wanted to be sure. I’m looking at the Office 365 client too so I might head that direction based on how my Mac Mail experience goes. I love the product from my experience using the unactivated simulated version and will most likely make a purchase soon. I only need clarify a few few misunderstandings. 1. Can the product run automatically in the background using the task schedular feature? 2. How would I use the product with different identities in Outlook 2011 for Mac? 1) Yes it can be run in the background. Technically it actually doesn’t run in the background but rather registers a schedule with the built in OSX operating system scheduler. The operating system will then activate the program and run a single archive of all enabled profiles. This avoids battery drain and other benefits. If you manually open the program just be aware that the schedule run will be skipped while you have it open to avoid clashing with a manual run you might have set in motion. 2) Our program uses the object model of the running Outlook instance to automate actions on your behalf. We haven’t built in the feature to cater for handling switching of identities which changes which accounts you have and what database of mail is present. You could in theory setup two different profiles. One for each identity but when the archive process runs one will fail depending in to which identity you are logged in to at the time. Haven’t tried it though. It’s not clear to me…do I have to run this application each time I restart my computer? Yes the application is something you schedule on your machine to automate the process of archiving via your Outlook installation. It’s a agent that works for your in the archiving process. It’s not server side on the exchange server. Hi Michael. I believe that the tool “moves” the emails, and not “copies” the emails, does it? I am asking as I would like it to copy the emails – I am actually archiving on a different (Windows) machine but would like to keep a copy of all mails on the Mac. I’m not understanding well from your comment what you are wanting to achieve and how you are setup with the Windows and Mac machine. Can you give more details, either here in the comments or send an email to support@7thdomain.com and we can guide you. For more background: yes it moves email from your online account to offline local storage on your Mac machine (but using rules such as mail older than X days). You can optionally move it from local storage to the cloud too if you want. In this way your mail is always accessible (which might address your issue). The intention is to only move out of your online account mail you don’t frequently need to access anymore (older mail). It doesn’t move all your mail. It’s a move operation so your online account is freed up of space (keeping below any quotas your company applies) and operates at higher speed. The tool avoids copying mail as this would become quite an intensive synchronising exercise as to what is copied and what hasn’t. Thanks for the prompt reply. I have a Windows machine and a Mac both accessing the same Exchange account, each with Outlook (2007 for Windows, 2011 for Mac). I would like to keep an archive accessible on both. The easiest for me is to keep the Windows machine doing the archiving as it is doing, but copying mail older than X days to My Computer on the Mac. I would just have to make sure that the Mac copies before the Windows archives. 5) You setup the Gmail account in Outlook on Windows so you can now see the archive on that machine too (it gets copied down in to the IMAP cache on your windows machine from the cloud). IMAP accounts in Outlook are accessible and searchable offline too so it works well. With the common Gmail archive between the machines you can always access your email from Outlook for Windows or Mac or even using the Gmail web interface. I see. That is creative. But I would like to keep archiving on the Windows because it can be backup to a corporate server. Also, from a security and confidentiality point of view, I cannot store those mails on a foreign Google server (I live in Canada). Amazingly, Gmail with all of it’s data centre security standards is likely more secure than your corporate mail server that you backup on 😉 , but I know many companies have policies and if you aren’t comfortable then I understand. I haven’t tried this solution but it’s a way to achieve all this without going out to the cloud. I have an activated product. When I try to run manually it only runs in simulation mode. How can I do a manual run? Hi Philg, just check the ‘Run in Simulation’ mode check box under the general tab isn’t checked on for any of your active profiles. Thy are set on by default when you are unactivated. The reason for this is safety to ensure you are aware that once you activate, mail will begin to move. It’s therefore important to explicitly go out of simulation mode by updating this setting. -) How to enable archiving of “some folders” with all subfolders included? For example I would like to specify folder “inbox” in “selected folders” to archive folder “inbox” with all subfolders. It seems that incl. subfolders is not possible at this time? -) How can I specify to archiving only one subfolder – for example inbox/mywork – in “some folders”? Hi Herbert, you are right it doesn’t recurse in to the folder structure when you select only some folders. I’ll look in to what is involved in changing this and let you know. Hi Herbert, ver 1.0.11 (available on the download page), now searches the entire folder structure for folders named in the ‘Selected Folders’ list when in “Some Folders” mode. Not just root. The ‘Excluded Folders’ are also available now in this mode. By using the ‘Archive sub-folders of excluded’ you can also recurse in to the sub-folders of excluded folders, searching for folders listed in ‘Selected Folders’ list. Hi Michael, thank you very much, great support!